26 June – The intent is to ride US Highway 64 from end to end. While not as famous as its sibling, Hwy 66, it was one of the major roads that stretched from the Atlantic coast to deep into the west. For me as a North Carolina native its starting point is Nags Head, NC. As an aviator this is an important area since the Wright brother’s first controlled powered flight took place just north of there at Kittyhawk. So why Hwy 64? The answer goes back over a dozen years ago. While backpacking at the Philmont Scout Ranch in New Mexico we passed under 64 as we worked our way out of a valley an into the hills. Hwy 64 was a road I was familiar with since it bisects NC from east to west and runs through Lexington, NC which is just north of our home in Rowan county. I had never thought about it traveling as far as NM. After I returned home I pulled out my map books and found that it runs from my home state to just shy of the Grand Canyon. I decided right then that I would motorcycle it from start to its finish, and then continue on to take a first-hand look at the “Big Ditch.” So My wife and I rode to Nags Head, dipped our toes in the ocean, and then returned home to complete the first leg of this trip. Highway 64 begins with long, flat stretches of highway that works through the former swamps of the Coastal Carolina Plain. Just before reaching the capital of Raleigh the landscape changed into the rolling hills of the central NC Piedmont. Alligators and turtles in the canals along the side of the road gave way to civilization as we saw less underdeveloped land and more urban sprawl. After a 300 mile “first day” we were back home and waiting for my younger son to come join us for the 4th of July celebrations. Soon, he on his Kaw 650 Versys and me on my ElectraGlide will ride this road from my home to Arizona and beyond. 7 July – Yesterday morning my son and I departed home to complete the second leg of the trip, and our first together. We traveled north to Mocksville and picked up 64 there. For the most part Hwy 64 parallels I-40 westward, but we want to avoid the interstate as much as possible. The Interstate system is great when your goal is to get someplace quickly and efficiently, but it rarely has much going for it in the way of scenery. It wasn’t long until the US 64 signs disappeared and all I had to navigate by were those for US 70, but you could still see traces of the old highway where street signs in some towns labeled it “Old 64-US 70.” We are headed for the southern Appalachians and the rolling hills soon gave way to the foothills of the NC mountains. So far this highway has gone from stretches of 4-lane divided highway with a posted speed limit of 70 MPH to switchbacks and tight curves with 35 MPH posted. The section between Rosman and Franklin may not be the Tail of the Dragon, but on a big bike it is a very spirited ride with plenty of curves to keep you occupied. The beauty of the mountains really hits me every time I go there. We rode on the edge of several rain storms and got wet but not soaked. I didn’t stop and pull out my rain gear since I could always see blue skies ahead of me. At least I could until we hit Franklin, NC. For the last hour of the ride we were boating instead of motorcycling. The Smokey Mountains earned their name as we went into the mist and it wasn’t long before the drizzle changed into a downpour. After darkness and rain reduced the visibility below what I consider the safe zone we departed 64 at Hayesville, NC and jumped down into GA for a visit with my mother in Blairsville. The day’s ride ended none too soon for me. Tomorrow morning we will pick up where we left off (well … few miles west of the exact spot) and will ride the remaining portion of North Carolina’s 64 as it snakes through the Appalachians and will then cross Tennessee in a day. A long day. Or at least that is the plan. 8 July – Blairsville GA to Memphis Tennessee. We got an early start and once again the Smokies lived up to their name. It wasn’t so much a fog as a mist as we traveled one of the remaining old sections of 64 to get on the current Highway 64. We traveled down a winding and very scenic road toward Chattanooga and into the city. It was easy going as the traffic was light and 64 is a major road in town. The only problem is that the highway markers disappeared and we found ourselves circling around the north-western part of the city looking for the bridge where 64 crosses the Chattanooga River. We finally relented (stopping and asking for directions was fruitless) and followed the Google route that had us use the I-24 bridge. We made good time as it was a multi-lane highway with a 65 MPH limit. We’ll see a lot of this on 64. We traveled through miles and miles of rich farmland, and saw very little traffic and few people. At about the half-way point in TN we stopped in Fayetteville for lunch. I highly recommend Honey’s Restaurant where the specialty is the Slawburger. No, it’s not just slaw on a bun (I asked) but a hamburger smothered in their own special slaw. I sampled some but it was mustard based, and while good it was too heavy on the mustard side so I went with another “special” cheeseburger. Outside of Fayetteville 64 dropped to two lanes and if transplanted there I would have thought I was back in central NC. It was getting late as we hit Memphis, and our campsite was across the Mississippi River in West Memphis, Arkansas. Arriving at 6 PM we hit the Friday evening rush hour traffic so we delayed eating until after we found the campground, set up the tents, and then started looking for a place close by. Surprisingly at 8 PM on Friday night there weren’t many choices in West Memphis (which is nothing like Memphis Tennessee), so we dropped the idea of tasting the local flavors and ate at Cracker Barrel of all places. The rest of the evening went well, except camped next to the Mississippi meant I fell asleep looking through the netting on my tent at the cloud of mosquitos that wanted to get in. Thank heaven for a good pup tent and bug spray. 9 July – Memphis to Fort Smith, Arkansas. The time change meant I was able to sleep in until 5:30 AM and for breakfast I fixed a cup of coffee outside of my tent. Once we were west of Memphis 64 took us through a long stretch of farmland with lots of cattle and crops as our scenery. They were good roads and we were able to keep a fast pace. Crop Dusters entertained us as they danced above the fields. At the middle of the state we began to hit one small town after another. West of Conway AR the quality of the road went down quite a bit, and after only 298 miles were reached our destination outside of Fort Smith. I have to say that Springhill State Park in Barling, AR was a really nice place to stay for our second night of camping. Since Fort Chaffee was nearby Andrew and I heard Taps being played right after we crawled into our tents. A perfect ending to a good day. 10 July – Ft Smith to Alva, Oklahoma. 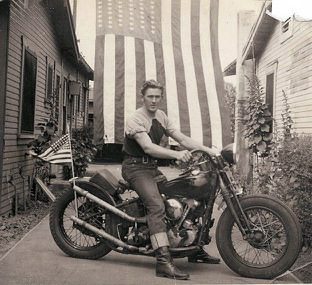 When we departed the campsite Hwy 64 took us through the town of Fort Smith, and in the middle of town I looked to my right and saw a statue of a soldier astride a World War II era Harley-Davidson. It turns out that William O. Darby, the founder of the US Army Rangers was a native of Fort Smith, and this was placed in the downtown area in tribute to this exceptional soldier. We then crossed the Arkansas River into Oklahoma and the road changed once again. We were able to keep making good time, but I have to admit that I was slightly disappointed in Oklahoma. I didn’t see an oil rig until I was west of Muskogee, and didn’t see a dead armadillo on the side of the road until we passed Tulsa. It was there that the roads became as grid of north-south and east-west asphalt. After leaving Pawnee the terrain reminded me a lot of my time in central Texas. The horizon was along way off into the distance. We also picked up a wicked cross-wind from the south that was strong enough to force us to ride leaned into it. We were in a perpetual left turn for a couple of hours and it really was a lot of work for us to keep the bikes going straight. It works pretty good until you hit a spot where there is no wind and you suddenly veer into the next lane. This was the perfect location for the Wind Farms we saw. I have seen some before, but we rode for a surprisingly long way while those huge electric generators stretch into the distance. Yes, I know I keep describing things as stretching into the distance, but there is no other way to describe the openness of Oklahoma. When we finally reached Alva we were pretty tired. We had knocked out 358 miles, but almost half of that was while fighting the cross-winds. The motel was basically deserted, and the manager offered the enclosed breezeway between the office and the main building as a place for us to keep our bikes. It turned out to be a good thing considering the weather that arrived the next day. 11 July – Alva to Raton, New Mexico. The weather seemed nice when I woke up to a sunrise that filled the horizon. I went for a run (the wind had died down to “tolerable”), and then started getting my gear ready to pack on the bike. That’s when the dark clouds showed up off to the southwest. By the time I got everything strapped down the wind was whipping and it was getting very dark. Within minutes it was almost too windy to stand and the rain was coming in horizontally in buckets. The breezeway became a wet wind tunnel. Thankfully most of our gear was in waterproof bags. Andrew and I settled down for the duration. My only concern was for our time schedule, but that was always somewhat flexible. A few fires and emergency vehicles screamed down the road and we could see the thick black smoke of what I assume were oil fires off in the distance. Probably set by some of the fattest bolts of cloud-to-ground lightning I have seen in a long time. However a new concern developed when the motel manager mentioned that, although there was a tornado alarm located in the field behind the motel she was going to check the weather service for any alerts. Hmmm … when the locals are worried I guess I should be too. Then is suddenly all went away, the skies cleared, and we were back on the road headed toward New Mexico. Heading out of Raton I saw a mural that reminded everyone of the history of the area, and being a cavalry guy I had to take a picture of it. We were both struck by just how long and straight the roads were. In fact, I had to laugh at a road sign that indicated a curve up ahead. It was just a gentle bend in the road that would mean nothing to us back home had to be noted by a sign. I guess that was to warn the truckers who are hypnotized by the monotony of the roads here. By the time we reached Guymon, NM it was 106 degrees and there was nothing to look at except oil rigs and big trucks. Time to stop for lunch and soak up some A/C. If you find yourself in Guymon be sure and stop at Caktus Jack’s steak house. The staff were friendly and the steak was one of the best I’ve had. The Oklahoma winds were still living up to their reputation as we were back to riding west leaning south into the wind for miles on end. The trees and scrub brush grew leaning north. I was wondering why we didn’t see more wind farms, but we did see a shipment of windmill blades on rail cars. Seeing them in the distance, and even somewhat up close, doesn’t impress the size of them until you see them next to you mounted horizontally on special rail cars. They don’t fit on regular cars, and are at least the length of two regular cars. As we approached New Mexico the tress (for what they are) gave way to smaller vegetation. I wouldn’t call them trees, as they looked more like overgrown bushes. The eternally flat land gave way to hills, and after we crossed into NM we even spied the Capulin Volcano. MORE TO FOLLOW .. Opportunities to add to this are limited.